THIS SET OF CARDS AND PRINTABLES IS IN SPANISH. SEE THE ENGLISH VERSION HERE. Cut out and laminate cards and put yoga cards on a ring or in a box . Use full sheet printables for bulletin boards, centers, or on smart board or iPad. 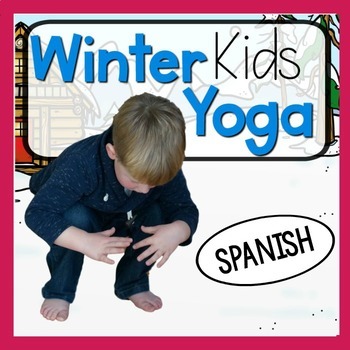 Anyone can use the Winter yoga cards and printables. They are great for use in the regular classroom, special education room, occupational/physical therapy and physical education. These are perfect for use during a morning meeting, brain break, physical education or during transitions. Use in therapies as warm-ups or prior to testing! Use all Winter! Are you looking for winter yoga poses but would prefer clip art pictures instead of pose pictures. GET THEM HERE These are the SAME POSES with a different presentation. Keep up with all therapy and movement related ideas!